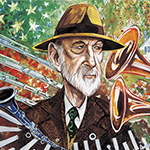 American composer Charles Ives (1874-1954) has been called a rare blend of the cultivated and the vernacular. Witness, for example, the middle movement of his Piano Trio, entitled TSIAJ (or THIS SCHERZO IS A JOKE). This concert will draw from the Music faculty and qualified students under the direction of Brian S. Wilson. Fun fact: Ives refused to copyright his music, insisting that anyone be able to use it. Sonoma Musica Viva was founded in 2010 at Sonoma State University as a chamber music alliance dedicated to the recognition of significant works from the 20th and 21st centuries.